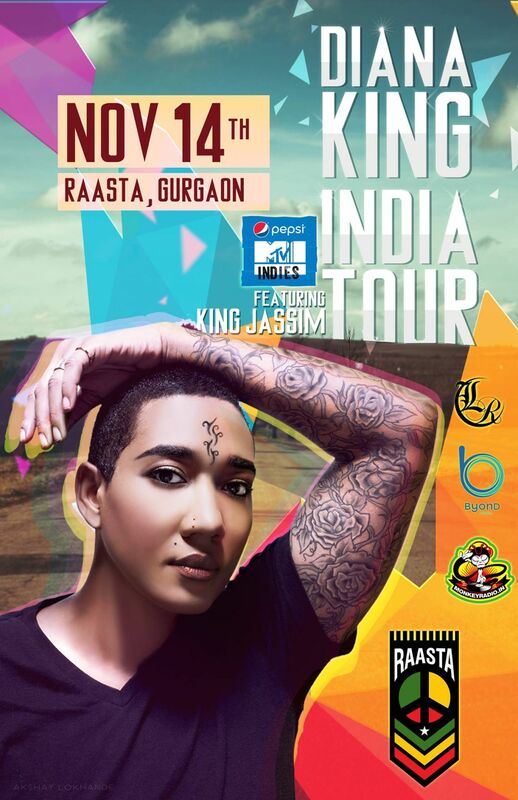 Jamaican superstar Diana King is coming to India this November! After years of crooning to the singer’s soulful voice, now you have a chance to sing along with her! The much renowned International R&B queen needs no introduction; her soulful reggae voice has endured the music scene since early 90’s. She has done it all during her time in the spotlight. Hitting global superstardom after appearing on Notorious B.I.G.’s tune Respect, she then created the hit track Shy Guy for the Will Smith blockbuster Bad Boys. Her music is a strong brew of Genres seasoned beautifully with Reggae. 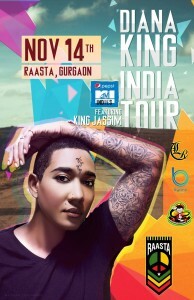 The lyrical storyteller and the Pop diva had announced her India Tour and her stop at Delhi would be Raasta. Catch her live blowing up your mind with her trademark new jack swing quality or experience her brilliance as she fills the atmosphere with her soulful performance. Mark your calendar, as she is set to perform at Raasta Delhi on November 13 and Raasta Gurgaon on November 14 to celebrate the spirit of brotherhood and peace. Mesmerize yourself with her vocal powers as Raasta sets a double treat for its patrons. Diana King aka ‘KINGSINGA’ is responsible for chart topping hits such as SHY GUY from the soundtrack of the Bad Boys movie, which starred Will Smith and Martin Lawrence, ‘I SAY A LITTLE PRAYER FOR YOU’ from My Best Friends Wedding starring Julia Roberts, LOVE TRIANGLE, SUMMER BREEZIN, LLIES, SPANISH TOWN BLUES from ‘Anniversary,’ the Grammy nominated album by Sly and Robbie, and co-wrote and was featured on TREAT HER LIKE A LADY from Celine Dion’s ‘Let’s Talk About Love’ album. Her distinctive mark can also be found on the Notorious B.I.G album, ‘Ready to Die’ which features KING collaborating with the late B.I.G on the track, RESPECT. Her distinctive flavor has been sought after by acclaimed musicians and artist’s such as, Brian McKnight, Kyle Eastwood, Jimmy Jam & Terry Lewis, and German Reggae Star Gentleman. Her catalogue also holds hit Reggae covers of famous songs like, AIN’T NOBODY, DO YOU REALLY WANNA HURT ME, HEY JUDE and PIECE OF MY HEART. KING’s first album ‘TOUGHER THAN LOVE’ featuring SHY GUY was released on the Sony Music Label. Her debut album grossed over 5 million in sales worldwide and led to her sophomore album ‘THINK LIKE A GIRL.’ Both original and remix versions of DIANA’S hit song I SAY A LITTLE PRAYER FOR YOU, the follow up single to the infectious L-L-Lies were huge #1 hits on the Reggae R&B and Dance Billboard charts worldwide.